Each pack contains 25 Tags. Ensure a safe and efficient lockout/tagout procedure to minimize injury risks and accidents. 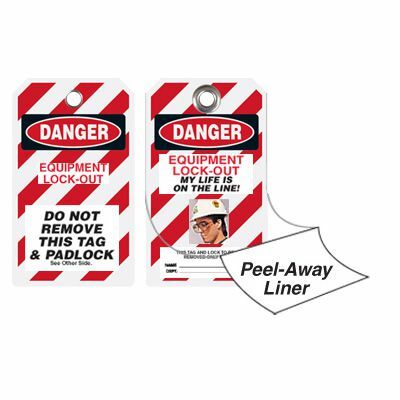 Fill in your personal information and vital safety details easily with self-laminating photo lockout tags. Calendered vinyl tags are available with self-adhesive overlay for better protection against chemicals, abrasion, grease, and solvents. 3/8" grommet hole for hassle-free attachment. Front of tag reads: DANGER EQUIPMENT LOCK-OUT MY LIFE IS ON THE LINE. Back of tag reads: DANGER EQUIPMENT LOCK-OUT DO NOT REMOVE THIS TAG & PADLOCK. EQUIPMENT LOCK-OUT DO NOT REMOVE THIS TAG & PADLOCK SEE OTHER SIDE. EQUIPMENT LOCK-OUT MY LIFE IS ON THE LINE!